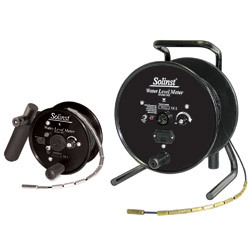 Solinst Model 102 Coaxial Cable Water Level Meters now have permanent, accurate laser cable markings every 1/100 ft or each millimeter. Providing high quality at a low price, they have probes for use in wells as small as 10 mm and a durable, flexible cable mounted on a sturdy reel. A 102M Mini laser marked Water Level Meter is also available.